The Fancy Pants Adventures was developed by Brad Borne and Over the Top Games, and published by EA 2D. It was released April 20, 2011 for 800MSP. Yet another XBLA game based on a flash game, The Fancy Pants Adventures is the next installment of the popular online sidescroller. Although it’s a sequel no previous knowledge of the series is needed to play this game. This time, pirates invade Fancy Pants’ home of Squigglesville and kidnap his little sister. Although this game is likely to be overlooked by heavier hitters like Super Meat Boy, Fancy Pants proves yet again that good XBLA games can come from online flash games and bring improvements to boot. Platforming – Fancy Pants is a wonderful 2D platformer. The platforming is based on speed, style, and physics, so lots of running around loops and fancy flips will be seen. The controls are simple and smooth, but sometimes momentum causes imprecision and slipperiness when changing directions. It’s simple that can be played by any skill level and still be fun. There’s a much larger focus on exploration than in the previous titles which adds more length and replayability to each level. 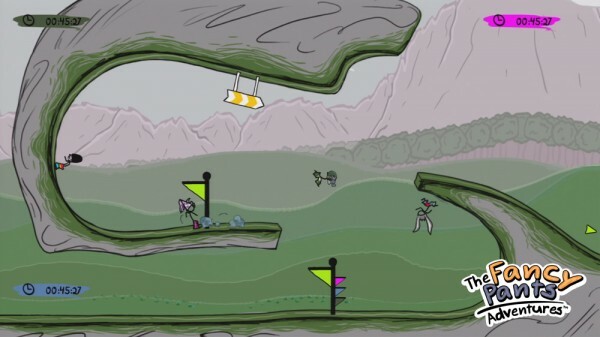 Players can decide whether to explore every nook and cranny for side missions, which include timed races and golf, or to rush through the levels. Style – The game looks like it was drawn by a child, but in a good way. The art is simplistic and colorful, creating beautiful, eye-catching levels. Hidden silly drawings can sometimes be found in the detailed backgrounds. Although not the greatest graphics, they do give the game the pleasant, happy feel. The game also has a great soundtrack, with each level having a fitting tune or a remake of the music from the flash games. Collectables – The game is covered with collectable squiggles, stars, and hidden areas. Squiggles act as health and provide extra lives, hidden areas give off one of 141 hidden costumes in the game. These costumes can be used to customize your character in a silly way. The best treat in the game is being able to play HD remakes of the original flash games once you get enough stars. All these bonuses encourage exploration and many playthroughs for completionists. Multiplayer – The game lets you play through story mode with up to three friends, supporting both online and couch co-op. In co-op, player compete to get the most squiggles by the end of the level, and the winner gets first choice of prize (either a new costume or extra life). While this may have its moments, the competitive modes are where the most is had. There’s also a race mode where players try to the first to end of a level as well as a highly addicting king of the hill mode. Combat – Although a cool addition when first unlocked, the abundance of sword-based combat takes away from the pleasant platforming. The combat becomes extremely tedious and takes the fun out of some levels. The system is also too simple, only requiring one button, which adds to the monotony. Co-op annoyances – Co-op can be fun, but only if played right. Players can easily mess up another player’s progress, which is an annoyance during a precision or timed section, forcing them to start over. The game keeps all players on the screen at the same time which sometimes causes the screen to stretch too much when players are split up. It makes it difficult to see where you are and the controls feel even slipperier. The story mode is much better as a single-player experience. Loading – The game loads a bit too much. Each level is split into two or more sections, and it requires a sit through a load screen between each. This really slows the speed of a level and feels out of place in such a fast-paced game. The Fancy Pants Adventures is a great platformer when played alone, but can be enjoyable with more players if you’re willing to overlook some annoyances. The fast-paced platforming is accessible and effective, but comes to a halt once combat is thrown in. This is a must have for fans of the series, but can be fun for anyone.